50 CLOPPENBURG, J.E./ PLANCIUS, P. Tabula Geographica, in qua omnes regiones, urbes, oppida� Amsterdam, 1643. Paper has been washed. Good condition throughout. 290 x 490 mm. 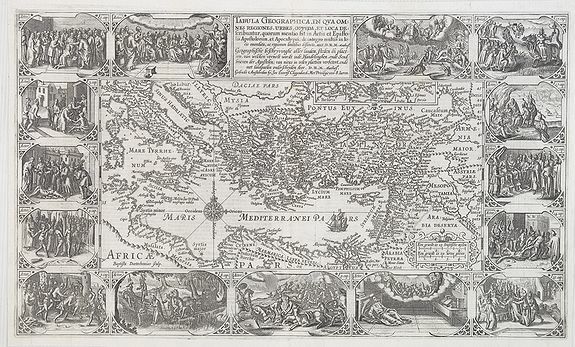 � This is the second state of the Petrus Plancius bible map. D.R.M. Mathes, whose identity we don't really know (Doctor Rudolf Mercator, Mathematicus ?? ), made very small changes in the Plancius plates : the ovals in which there are pictures of biblical stories have been slightly changed. In the Mediterranean there is a compass rose. 52 JACOTIN, P. J�rusalem et Jaffa. Paris, 1807. Sur papier fort. Rousseurs. - Brown spotting affecting the engraved area. 500 x 790 mm. � Carte de Palestine repr�sentant les villes de Jaffa et J�rusalem. Inscriptions traduites en arabe sur la carte. 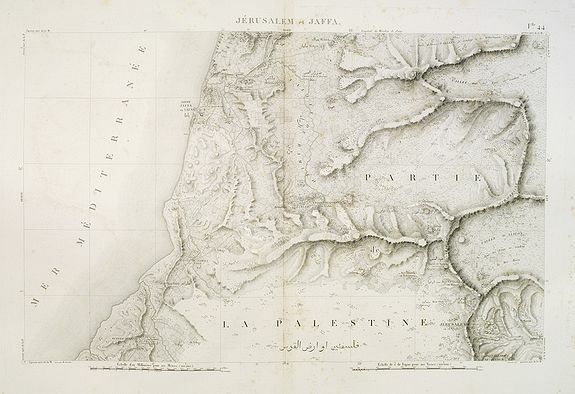 - Topographic map of old Palestine showing the towns of Jaffa and Jerusalem with indications of the archaeological ruins. Pierre Jacotin (1765-1827) was a cartographer initially attached as geometrician to the land register of Corsica (1781-96). He followed Bonaparte to Egypt (1798) and quickly became director of the topographic operations. At his return in France (1801), he was promoted with the rank of colonel and was named chief of the topographic part of the general Deposit of the war. He preserved these functions until his death. He had a great part with the rapid progress made at that time in topographic engraving.